This is a swivelling stool, with a chromed metal base, and a free-form tech seat that makes it the perfect companin for your high furniture, you counter-tops, and your bars. Swivel stool with hydraulic mechanism, structure in freeform-tech and chromed metal base. 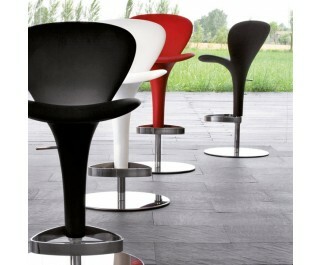 The stool’s concept is born from the idea of a petal, elegant yet original as Tonin Casa’s style. Available in white and black.